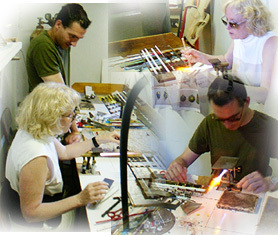 Venetian Glass Art is a direct importer of Venetian Glass and Murano Glass. Working directly with the furnaces in Murano to bring the finest from the Murano Glass furnaces directly to our customers. Ours is a story of the love of Venetian glass, a fascination with the techniques of glass blowing and, of course, a love of Italy, its people, and its culture. It all started with a trip to Venice in 1984 when Brenda purchased a Moretti glass necklace with the famous Murano beads. Many compliments and requests by friends prompted another trip and more purchases and sparked an interest in the glass. We began studying the language and our love and appreciation of the people and the culture grew. Importing the wonderful glass of Murano was a natural extension of our new lives in Italy with friends and family. Exhibitors for many years with the International Gem and Jewelry Shows, the San Francisco International Gift Show and at various shows in the San Francisco Bay Area, we opened our first online store in 1998 on Yahoo Stores. We were pioneers in the E-commerce age! And, the rest, as they say, is history. We remain a family owned business located in Santa Clara and Sunnyvale, CA, USA where we have been importing Venetian Glass and Murano Glass commercially since 1993. One of our goals at Venetian Glass Art is to provide you with the most exquisite pieces of Venetian and Murano Glass available, whether it be a blown vase or a Murano Glass bead necklace. We do this by working directly with individual artists and families, many whom are second and third generation glass blowers or bead makers. We're sure you'll find the quality of our products to be unrivaled. We only collect personal data required to process your order and your payment and maintain that information per the US laws regarding credit card transactions. We have an opt-in newsletter and each issue of the newsletter provides a link for you to opt-out removing your name from our email list. It is "opt-in" meaning you must sign up to receive this newsletter using the links at the bottom of our webpages. We do not sell, rent or otherwise distribute any of your data (name, address, email address, phone number, card number, etc). We do notify you by email when we ship your order and when out-of-stock items are available. If you do not wish to be notified or contacted via email, please email us that you do not wish to be contacted. However our system automatically generates email notifications when you order and when an item is shipped. This is our policy.